Celebration springing from the roots of hardship is the theme of a citywide contemporary art festival, Prospect.4, continuing in New Orleans through Feb. 25 – overlapping with Mardi Gras; Fat Tuesday is Feb. 13 this year. Prospect began in 2008 as a response to the devastation of Hurricane Katria. The motto of Prospect.4 is “The Lotus in Spite of the Swamp,” and the featured artists examine issues of identity, displacement, ecology, and racial and economic inequity. Seventy-three artists are featured from the U.S., Europe, Africa, Latin America, and the Caribbean. Thirty-two works were commissioned specifically for the event, and all told they spread across 17 city venues, including museums and public spaces (although most of the art is concentrated in four venues). Outdoor exhibits are free, but the museums have admission fees and varying hours. Seeing everything could take up to three days. If your time is limited, start at the Contemporary Arts Center New Orleans and the Ogden Museum of Southern Art, which sit across the street from each other in the Warehouse District. The bulk of the Prospect.4 art is on display at these two institutions. At the Ogden, London-based John Akomfrah’s moody, heartbreaking multichannel video installation “Precarity” looks at the life of Charles “Buddy” Bolden, a pioneering New Orleans jazz musician. In 1907, he was institutionalized for the rest of his life with schizophrenia and left no known recordings. Wayne Gonzales’s acrylic paintings from photos of contemporary Louisiana landscape are cleverly positioned alongside pastoral scenes by mid- to late-19th-century Louisiana bayou school painters to evoke the passage of time. The Contemporary Arts Center features a cacophony of materials and themes. 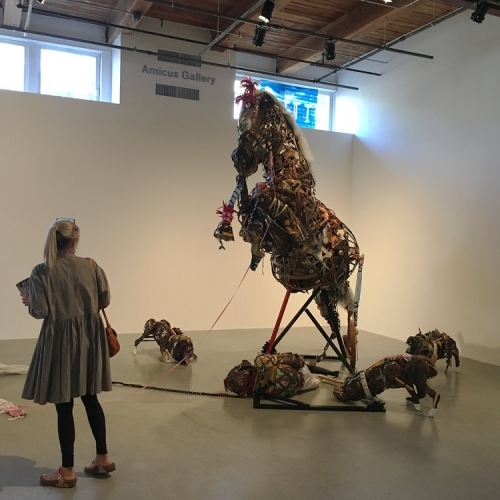 Lavar Munroe’s towering sculpture of a rider fallen from his horse — made from fabric, tennis balls, rubber, wood, hair and so much more — is a centerpiece. Brad Kahlhamer’s wire-and-bell dream catchers are delicate and intricate. The green flora in watercolor panels by Cuba-born Maria Magdalena Campos-Pons, who explores how identity is formed through gender, history and religion, are lush and sinewy. Check out Kader Attia’s circular floor sculpture of more than 2,900 bent beer cans crowded together and Margarita Cabrera’s vinyl, thread, metal, and wood baby grand piano sculpture that looks like it’s about to fold into itself.